I had the privilege to travel to Menomonie, Wisconsin on July 30th to premiere a new piece I wrote called “Legacy of Honor”. 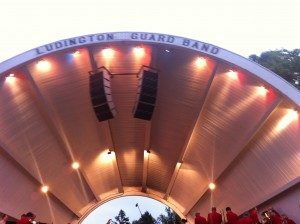 It was commissioned by the Ludington Guard Band to celebrate their 125th anniversary of existence. I felt very honored to be a part of this historic event. It was a wonderful experience. It was like going back in time to a slice of Americana. The town park in the middle of the city had a band shell (picture above) that even had the name of the band on it. The band plays concerts in this park band shell every Tuesday evening all summer long and has for 125 years – Amazing! 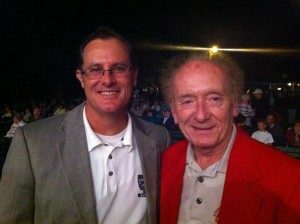 There were close to 2,000 people in attendance for the gala concert celebration including the town Mayor and state Representatives and Senators. Along with the concert there was a pavilion where a local church was selling pie, wonderful pies, delicious pies! It was a scene right out of a Norman Rockwell painting. It is an experience I will never forget and the warmth shown me by the band members and town’s people was unbelievable. I wish to publicly thank Carroll Rund the band President for his hospitality during my stay in Menomonie! This will be a memory I treasure forever! The piece will be published in the 2014 release by Carl Fischer Music.